Do you battle with the removal of persistent smears, water streaks and dust build-ups from your windows? Do they cost you too much elbow grease and you have no will to take part in this chore? This process will no longer consume a lot of your time and energy! The professionals of window cleaning in Manor Park will give you a hand! You will be able to use your free time as you like – the trained and reliable team members will deal with the washing and polishing. We offer thorough cleaning services for all kinds of glass surfaces. Read further and discover more about the different advantages you can get. We also provide our professional services in nearby areas: South Woodford, Little Ilford, Aldersbrook, Petersham, Richmond. You can be sure that the gleaming look of your business property is certain. The specialists will will fulfil your need of top-notch commercial window cleaning. With the help of our water-fed extension pole tools, you will witness fast and perfect washing of all windows all the way to the fourth floor. For buildings higher than that, we employ our rope access gears. It is our advanced method of reaching glass panes on taller edifices. No matter what is the size of your business premise – a humble corner shop or the Shard – we will ensure perfect look of your windows. We are glad to use the latest methods to make sure that you get the finest window cleaning. The glass surfaces of your building will be spotless after we use water-fed extension pole system and high pressure cleaning on them. We use our vehicles to supply the poles with water and we can reach as high as the fourth floor. In case you require polishing of highly-placed windows, we have rope access cleaners on hand. Call us on 020 3746 3113 and get in touch with us – these great methods will bring you results right away. The technicians have the experience and the essential equipment to provide you with both domestic and business window cleaning. You can depend on us for every type of glass surface cleaning. For instance, we can clean small or double windows, French doors, sash windows, patio doors and bay windows. In addition, if you have garden glass surfaces, conservatory or skylights, we can clean them too. We use the latest ways and the latest equipment for all the aforementioned types of windows. 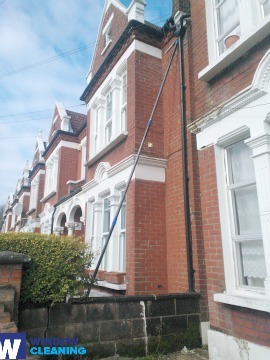 You will see your absolutely clean home after the best window cleaners in Manor Park finish their work. We provide great services for the entire London locality. The leading ways of cleaning are included in our working routine – including water-fed extension pole system and and hard pressure cleaning. You will surely see the change of your home's entire look – we use purified water for the process of in and outside window washing. Give us a call today on 020 3746 3113. Our customer service representatives will guide you and answer any inquiries. In addition, you can use our on-site booking from. The nearest tube station serving E12 Manor Park is Richmond.